A segunda edição do livro Algarve Wildlife - the natural year, mostra, numa maneira muito completa, a biodiversidade algarvia ao longo do ano. Focando-se nas regiões mais longes da famosa costa algarvia, este livro explora as áreas florestais, os matos, as almargens, pastos e as linhas de água, descrevendo os animais, plantas e fungos que se podem observar em cada altura do ano. O livro possui mais de 600 fotos de paisagens, insetos, repteis, anfíbios, aves, mamíferos, plantas e cogumelos. A acompanhar as fotografias ainda pode encontrar alguma informação que nos permitirá ir explorar cada um dos locais. Este livro foi escrito [maioritariamente] por Clive Viney e acompanhado [maioritariamente] pelas imagens de Ray Tipper, ambos estrangeiros apaixonados pelo Algarve. Este livro foi graciosamente oferecido à Almargem e pode ser consultado na nossa biblioteca. 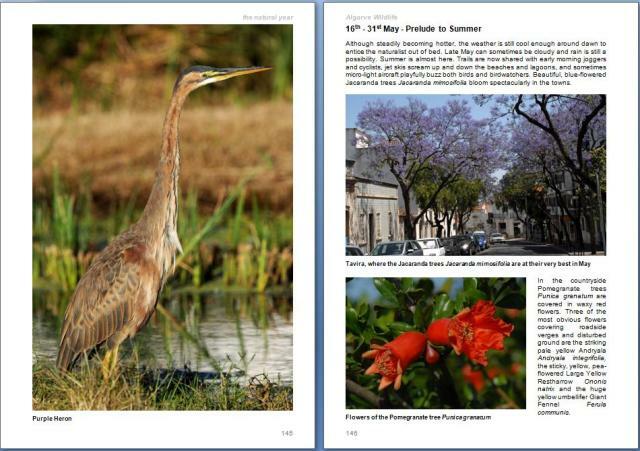 First published in 2009, this new edition of Algarve Wildlife - the natural year, one of the most successful books about the region, is fully revised and substantially enlarged . Away from the coastal hotspots is a seldom-seen Algarve - one of peaceful woodlands, flower-filled meadows and quiet river valleys all teeming with fascinating wildlife, from beautiful birds and butterflies to the more elusive chameleon and mongoose. Lavishly illustrated with some 600 colour photographs of birds, butterflies, mammals, reptiles, wildflowers and scenic views of the Algarve countryside, together with a map, directions and descriptions of top locations for wildlife and scenic walks. Clive Viney is the author of The Birds of Hong Kong and South China, which is available in English and Chinese and is the standard regional guide. First published in 1977 it is now in its eighth edition. Clive, a keen naturalist, spent most of his working life in Hong Kong where, as a trustee of World Wide Fund for Nature Hong Kong, he was editor-in-chief of their magazine About Life. Ray Tipper began his birding on the North Kent Marshes at the age of eleven. He left Britain in 1973 spending most of the next 22 years in Hong Kong. As a trustee of WWF he was intimately involved with its renowned Mai Po Marshes Nature Reserve. It was in Hong Kong that Ray turned to bird photography, which quickly became his major interest. Having gained associateship of the Royal Photographic Society in 1990, his photographs appear in journals and books throughout the world. He spends much of his time in the Algarve, where his intimate knowledge of its birds has been recognised by his appointment as a member of the Portuguese Rarities Committee.